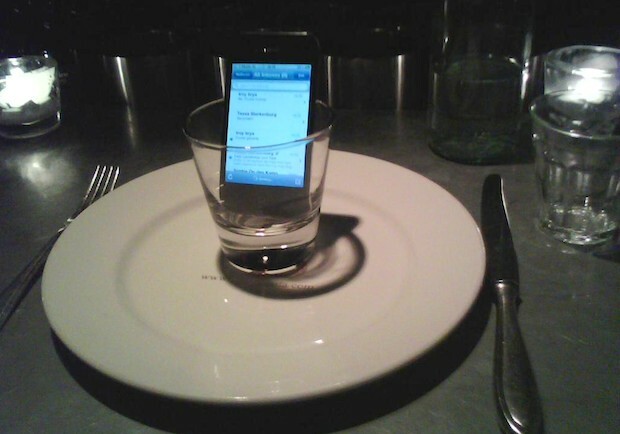 Here’s one of the stranger tips I’ve seen to boost your iPhone reception; put it in a glass. Yea, like a water glass. I can imagine a surge of funny pictures featuring people talking to water cups, but apparently for some people this actually works. a few years ago one of the waitresses… discovered (how?) that if you put a phone in an empty glass it dramatically improves the reception. The Pasta e Basta restaurant is basically stuck in a concrete basement so reception has always been awful. But since they found out about this trick they at least have had enough reception to make and receive calls. The waiter gave me glass, I put my iPhone in, reluctantly, and lo and behold: I got 3 bars and no 3G but some GPRS. Not perfect but a huge improvement from the ‘No signal’ message I got earlier. I decided to try it out myself. I have AT&T and live in one of those famous reception dark spots, so it’s pretty easy for me to find a place where the iPhone has no reception. I put the iPhone in a glass and… still no service. Just for fun I went to a place where I usually have a few bars and it did increase one bar of reception, but I get the same effect from setting the iPhone on a table and just not holding the iPhone at all. Not too impressive. The next step was to beat the dead horse, so naturally I took this a step further and tried to make a phone call with the iPhone in a glass. Big surprise, it’s a terrible experience. You can’t talk normally (hint: there’s a reason phones aren’t made to resemble a water glass) so I put the iPhone on speaker mode instead, this caused the calls recipient to hear themselves talk in a super annoying echo chamber. No dice for me, but maybe it’ll work in a bind for you. Oh, but it does make the iPhone speaker phone sound a lot louder, as the sound projects from the water glass. So I guess there’s that! The better solution is to use an inverted pie pan (or aluminum, disposable version). Invert the pan so that you may lie your phone on the flat surface. This could possibly get you past a dead zone and not have the annoying echo when using the speaker. And how to you talk on it when it’s in the water glass? In some countries, cell phone jammers are legal (not the USA, alas) and restaurants, theaters, etc. install them so patrons are not annoyed by obnoxious mobile phone users. An imaginary “fix” – pure placebo, as the only thing that glass does to a cellphone frequency signal is attenuate it, moreso if the material has a high metallic content. Just don’t try putting it in the toilet, it doesn’t help reception. I do this all the time when tethering to get faster speeds. Your phone can be plugged in or not… Flat on top upside down right side up but I found the best is when balanced on top! Been doing this for a few years, just make sure your glass is empty of course. Anybody ever thought about a cheap marketingtrick getting the restaurant mentioned for free? Works everytime you want free publicity.